Packed up in the morning, pedaled over to the water spigot to fill up my water bladders, and was surrounded by Boy Scouts wanting to check out the rocket trike. A couple of the scoutmasters rounded up some more kids and asked me to say a few words about my ride. They listened intently (probably didn’t hurt that I told them I used to be a Boy Scout myself). Got some high fives from some of the boys on my way out. Rode 10 miles to the next town, where I got a big lunch. Then pedaled another 15 miles to a little Thai stand everyone was recommending and loaded up with another meal there. After going without yesterday, wanted to make sure my caloric intake was covered today. 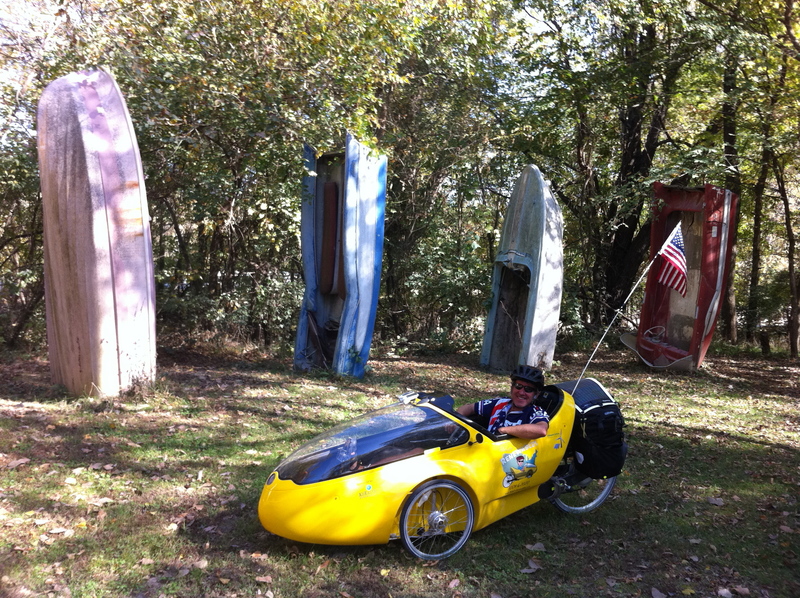 Rolled by “Boathenge” (an artistic display of old boats sticking out of the ground) nearby, then back on the trail. Rolling down the trail a little later, saw a handmade sign announcing a blues band, the “Naked Hippies” (they weren’t naked), was playing a free show down at the river from 1:00 to 5:30. It was a little after 1:00, and I love the blues, so figured I’d check it out. Great scene: a raised stage right next to the river with a band playing and locals kicking back in fold-up chairs. I listened to a couple songs, rolled up to the stage during a break to drop a couple of bucks in the tip jar, then had a fun banter with the band members, who loved the trike and were excited to hear about the ride. Great sound, which you can hear here. Further down the trail, ran into Gary from yesterday, who told me about a bike hostel in the town of Tebbetts that I should be able to make by nightfall. I asked about ATMs, as I hadn’t planned on using cash for days on end (a necessity in small towns along the trail), and he proceeded to empty his wallet so I would have some cash for the night. Thanks, Gary! Lots of great interactions with fellow bikers on the trail today, including Bill and his daughter Sydney who were on their tandem bike and rode with me for a stretch. 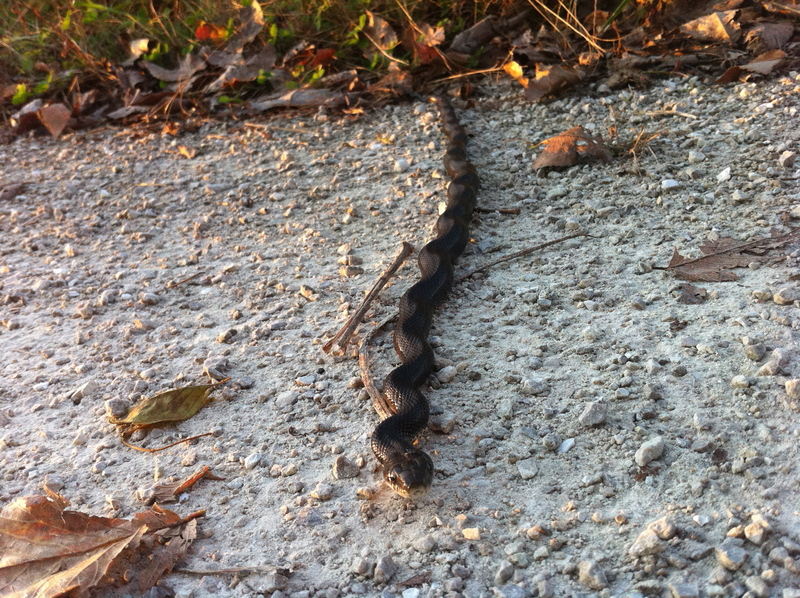 And then I came across this beautiful snake, soaking up the last of the day’s warmth on the trail. 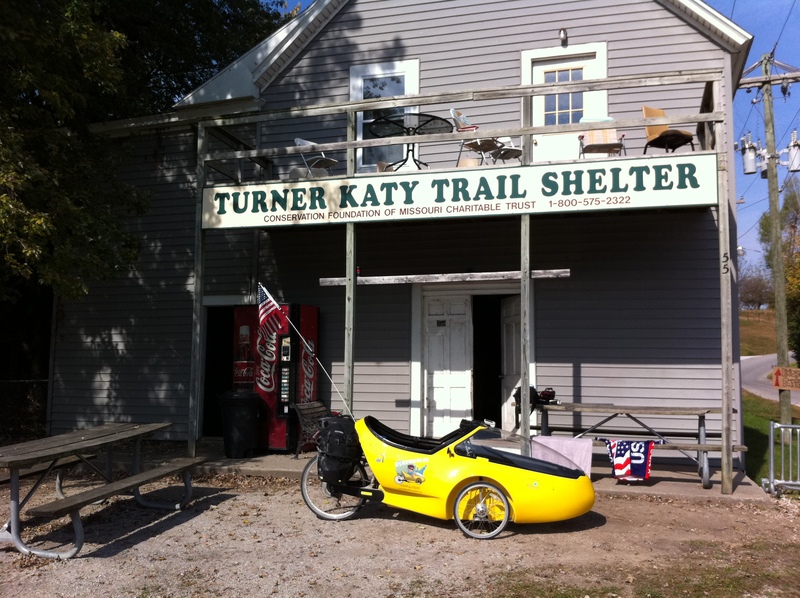 Rode the last mile in total darkness, soaked in sweat (like every day) – with one headlight already out of power and the other probably not far behind – so was relieved to find the Turner Katy Trail Shelter in Tebbetts. I thought I’d probably roll into a darkened hostel, but there were bikes scattered all around the front yard, and a warm light glowing inside. Met some really cool University of Nebraska students biking the trail who fixed me up with some pancakes. Several shared with me their disdain for the two major political parties and thanked me for “being their voice in Washington, DC.” Nice. The terrain today was totally flat, unlike yesterday, so the chat (the finely crushed gravel they use on the trail) slowed me down. Only got 63 miles in, and they were hard miles. But right knee feeling better and stronger. Will probably use the electric motor some tomorrow, to get some more miles under my belt. Need to keep moving if I hope to have any chance of getting to DC before the snow flies. This entry was posted in 2010 Ride, Blog, Video and tagged boathenge, katy trail, naked hippies, ride for renewables, turner katy trail shelter. Bookmark the permalink.